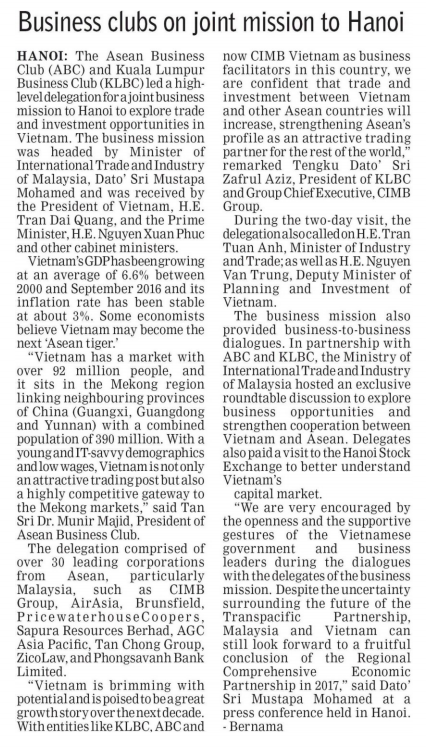 HANOI: The Asean Business Club (ABC) and Kuala Lumpur Business Club (KLBC) led a highlevel delegation for a joint business mission to Hanoi to explore trade and investment opportunities in Vietnam. The business mission was headed by Minister of International Trade and Industry of Malaysia, Dato’ Sri Mustapa Mohamed and was received by the President of Vietnam, H.E. Tran Dai Quang, and the Prime Minister, H.E. Nguyen Xuan Phuc and other cabinet ministers. “Vietnam has a market with over 92 million people, and it sits in the Mekong region linking neighbouring provinces of China (Guangxi, Guangdong and Yunnan) with a combined population of 390 million. 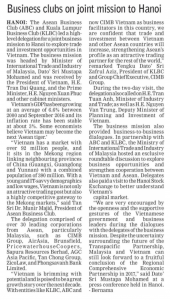 With a young and IT­sav vy demographics and low wages, Vietnam is not only an attractive trading post but also a highly competitive gateway to the Mekong markets,” said Tan Sri Dr. Munir Majid, President of Asean Business Club. The delegation comprised of over 30 leading corporations from Asean, particularly Malaysia, such as CIMB Group, AirAsia, Brunsfield, PricewaterhouseCoopers, Sapura Resources Berhad, AGC Asia Pacific, Tan Chong Group, ZicoLaw, and Phongsavanh Bank Limited. “Vietnam is brimming with potential and is poised to be a great growth story over the next decade. With entities like KLBC, ABC and now CIMB Vietnam as business facilitators in this country, we are confident that trade and investment between Vietnam and other Asean countries will increase, strengthening Asean’s profile as an attractive trading partner for the rest of the world,” remarked Tengku Dato’ Sri Zafrul Aziz, President of KLBC and Group Chief Executive, CIMB Group. During the two ­day visit, the delegation also called on H.E. Tran Tuan Anh, Minister of Industry and Trade; as well as H.E. Nguyen Van Trung, Deputy Minister of Planning and Investment of Vietnam. The business mission also provided business­to­business dialogues. In partnership with ABC and KLBC, the Ministry of International Trade and Industry of Malaysia hosted an exclusive roundtable discussion to explore business opportunities and strengthen cooperation between Vietnam and Asean. Delegates also paid a visit to the Hanoi Stock Exchange to better understand Vietnam’s capital market. “We are very encouraged by the openness and the supportive gestures of the Vietnamese government and business leaders during the dialogues with the delegates of the business mission. Despite the uncertainty surrounding the future of the Transpacific Partnership, Malaysia and Vietnam can still look forward to a fruitful conclusion of the Regional Comprehensive Economic Partnership in 2017,” said Dato’ Sri Mustapa Mohamed at a press conference held in Hanoi.